Spritzer Bhd is engaged in the manufacturing and selling of a range of bottled water products. The company operates through three segments. Its Manufacturing segment is involved in the manufacture of natural mineral water, carbonated flavored water, distilled water, drinking water, non-carbonated flavored water, polyethylene terephthalate preforms and bottles, caps, and toothbrushes. The Trading segment is into the trading of bottled water and other consumer products. Its Other segment comprises of the recreational park, investment, and properties holding. The company offers SPRITZER brand of natural mineral water. Its products include Spritzer natural mineral water, Spritzer dispenser series, Spritzer love limited edition, Spritzer tinge, and Spritzer pop. birkincollector suddenly moving together with the mother, YEELEE last friday. any potential corporate exercise? Hi, Shinado... i support you & agree with your views,,,,wait QR....shld be Good > 8m..
hopefully. consider production cost of bottles reduce and revenue increase..
MadMax This stock is a must have stock. Believe me. greatful Yeelee and Spritzer, which one better? RonnieKimLondon Spritzer is trading at 12X earnings. 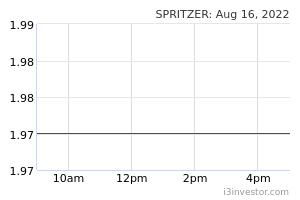 Spritzer is the market leader in premium mineral water in Malaysia. A regular bottle costs RM2.60-2.80 while F&N's Ice Mountain costs RM1.50-1.80. Dasani is chaeper at RM1.30. Spritzer has constructed a new plant in Johor.The southern region and Singapore have tremendous potential. kakashit I like Dasani filtered, sweet in taste but not raw as mineral water. RainT Why today drop 4%? RonnieKimLondon The latest development in the food & beverage industry in Thailand is that soft drinks could cost up yo 25% more in Thailand. The National Reform Steering Assembly's health panel approved a proposal to increase taxes for non-alcoholic drinks with high sugar content. This sugar tax on soft drinks has been imposed on soft drink bottlers in US. We expect this sugar tax to be imposed in ASEAN countries over the next couple of years. moneySIFU Unbelievable performance from Spritzer, well done. chooweeteh Tats right. High sugar content drinks should be taxed. We welcome a culture with no soft drinks but plain mineral water to curb rising health issues with improved life styles. That to me is the most basic of investment, we mobilize our capital in a way that can bring benefits to society. chooweeteh Yee Lee is the Holding company of which Business involves distribution and trading. As a subsidiary, the company enjoys wide distribution network that is important for Consumer products. chooweeteh Personally i wont mind as it is Drinking Water. In ten to twenty years if our society can adopt plain water drinking habits and be more healthy conscious, then this company would be seen as alternative to F&N. RainT Qtr report out??? Drop 5% ?? heata anyone know whats wrong with spritzer? 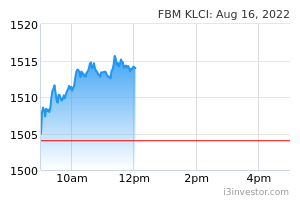 drag down by klci? RainT Sales and profit grow every year since 2012 until now. Water is important basic needs. moneySIFU Drink Cactus also can, it's also product of Spritzer, cheaper. gaban88 hot weather org minum byk air....x cukup bajet nk bli spritzer....one day i will buy..
wan7075 adui, why spritzer latest qr so poor? 峰中奇缘 Mineral water producer Spritzer Bhd announced that FMR LLC, part of United States-based Fidelity Investments, has emerged as a substantial shareholder after it acquired 38,100 shares in the open market. This boosted FMR's holdings in Spritzer to 9.25 million shares, equivalent to a 5.07% stake. FMR's share acquisition in Spritzer was part of a simple portfolio of investments, the company said. Headquartered in Boston, Fidelity Investments is the fourth largest mutual fund in the world, with presence in eight other countries across North America, Europe, Asia and Australia. i3longterminvest Anyone got read about spritzer from this blog? GalGunAmmo Uptrend with increasing price and volume. Interesting. rumblexxa high liquidity with spritzer? johnbrooks I thought spritzer very big company.... Share not liquid at all..
Varcity Greetings, VarCity will be visiting three listed companies during our Engage & Exchange #3 session. You can now ask questions to the management of Spritzer via VarCity. Kindly post the questions in the poll and get a feedback from the management.